The situation has already reached crisis point in the war-scarred, underdeveloped and blockaded territory, says Monther Shoblak, general manager of the strip's water utility. "More than 97 percent of the water table is unfit for domestic use because of salinisation never before seen," he said. 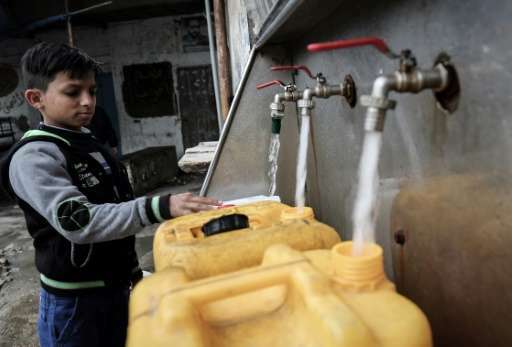 The United Nations puts scarcity and pollution of water resources at the forefront of Gaza's scourges. 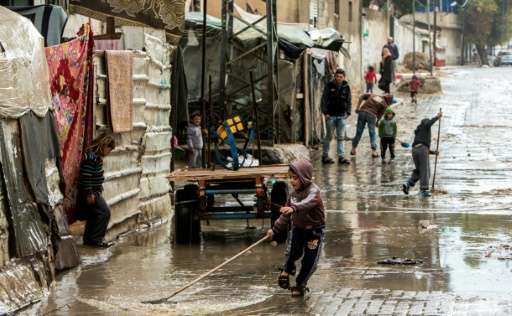 "If the catastrophe does not arrive this year, it will surely be here within three years," said Zidane Abu Zuhri who is in charge of water issues at UNICEF, the world body's children's fund. Almost all of the narrow coastal strip's two million people depend upon its water table for their private or commercial needs, reaching their taps through a dilapidated public system or pumped privately from the ground. The health of Gazans is suffering as a result. "Each year we see a 13-14 percent increase in the number of patients admitted with kidney problems," said Dr Abdallah al-Kishawi, head of nephrology at Shifa Hospital in Gaza City. These kidney problems have "previously known origins, such as tension, diabetes and hereditary diseases, but there is no doubt that water pollution also plays a role", he said. High salinity, for example, can cause kidney stones and problems in the urinary tract. In 2012 and again in 2015, the United Nations listed the threats that could render the enclave uninhabitable by 2020. It spoke of the ravages of three wars since 2008 and the decade-long Israeli blockade, an unemployment rate of almost 44 percent and food insecurity. UN officials have called for the blockade to be lifted on the territory run by Islamist movement Hamas. Israel says however that it is needed to keep Hamas from obtaining weapons or materials that could be used to produce them. In a territory on the edge of the desert, bounded by Israel, Egypt and the Mediterranean Sea, where watercourses are reduced to mainly dry gulches, the water table is overexploited. The level drops and seawater seeps in, raising salinity. Brackish water is then used for cooking, showers, laundry and irrigation. Well-off Gazans dig their own wells pumping water brought to the surface from dozens of metres (yards) below. 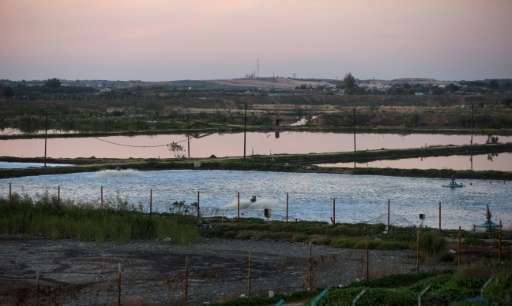 Sami Lubbad, in charge of environmental issues at the Gaza health ministry, says pollution is of two kinds, chemical and microbiological. At the deepest part of the water table, these pollutants combine and raise the chloride and nitrate levels. They can cause congenital cyanosis in babies "and also play a role in the development of cancers", says university professor Adnan Aish. "The prevalence of cancer is higher among people living near water treatment plants," he adds. Microbiological pollution is caused by bacteria of faecal origin, mainly from wastewater and agriculture runoff. Chemical pollution is caused by pesticides but also, say experts, by the toxic remnants of ammunition fired during wars. Lead and sulphur can cause kidney problems, says Dr Kishawi. Gaza's wars have severely damaged already-lacking infrastructure. Much of the wastewater is not treated, allowing it to seep back into the soil and pollute water supplies. "Around two-thirds of Gazans buy their water in the private sector," often in bottles sold for two shekels (around $0.53) per 16 litres, says June Kunugi, head of UNICEF ​​in the Palestinian territories. 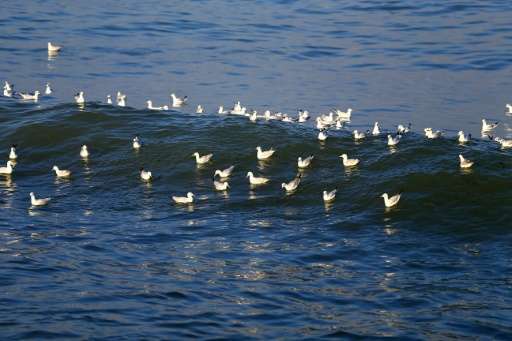 But such water, often produced only by desalination, can also be polluted. "Many children have parasites and worms and suffer from diarrhoea and malnutrition," said Kunugi. At the edge of the Mediterranean, desalination of sea water is one potential solution. In January, the largest desalination plant in Gaza partially opened with the help of international aid. It will supply 75,000 people with safe water, a number that will rise to 150,000 when a second phase is opened. Other plants are planned. But radical changes in behaviour are also needed, including storing rainwater and reusing water, said Kunugi. Experts stress that it is crucial to allow the water table to be reconstituted without touching it. "If no solution is found by 2020, disaster will occur and man will be solely responsible for it," warns Shoblak of the water utility.